Whether or not the mythical "Apple Car" ever becomes a real product, the company is tinkering away on a top-secret automotive project. Sources familiar with the development of "Titan" say it's well beyond the concept stage, with serious work underway at a site located off of Apple's Cupertino campus. Specifically, two people with knowledge of the project say Apple has been working on it and receiving shipments related to its development at a building just minutes from 1 Infinite Loop, in the town of Sunnyvale. It is unclear if this secondary campus is ground zero for "Titan." 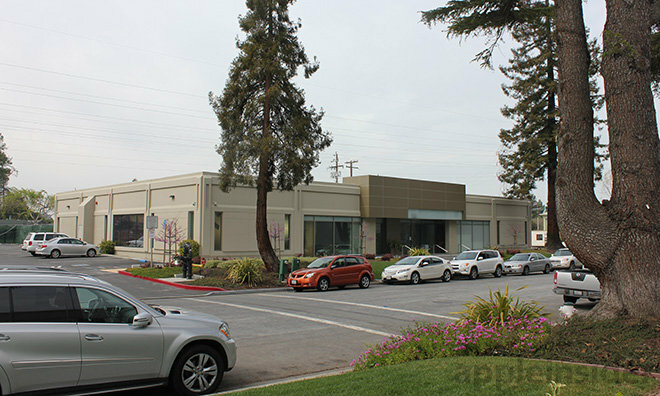 But AppleInsider can confirm that Apple does indeed have a large presence at the location, and that numerous automotive-related renovations, including an "auto work area" and a "repair garage," have been constructed on the premises. Last fall, AppleInsider was told that Apple was recruiting engineers from automaker Tesla for an undisclosed electric car project dubbed "Titan." At the time, the information could not be verified, and the editorial staff collectively decided that the details —like many other unverifiable tips received —were not reliable enough to be published. Since then, however, much of the information first provided by that source months ago, including the "Titan" codename, has been corroborated by other sources who spoke with numerous other news outlets, including The Wall Street Journal, the Financial Times, and Bloomberg. 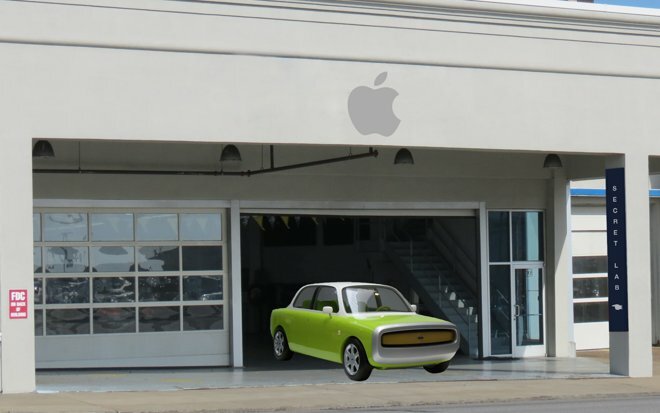 That revelation led AppleInsider to revisit those claims from last fall to find out more about the supposed Apple electric car, said to be under development at a top-secret building known by the internal codename "SG5." The results of this extensive investigation led to Sunnyvale, Calif., and the home of a mysterious market research firm dubbed SixtyEight. Nestled amongst a number of verifiable Apple-run offices, it is believed that this location is a key component of the "Titan" project. 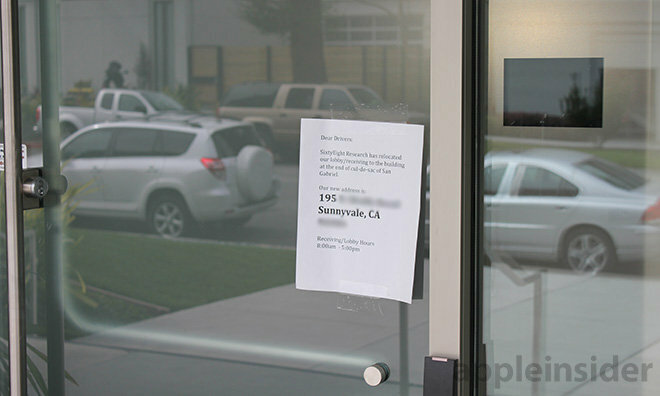 Apple's presence in Sunnyvale is not a secret. It was first reported last May that Apple was to occupy seven buildings, comprising nearly 300,000 square feet, of a large office complex that previously belonged to semiconductor firm Maxim Integrated. At the time, it seemed like business as usual; Apple is tight on space at 1 Infinite Loop and has been leasing other nearby buildings for years —the company has nearly monopolized the available commercial space in neighboring Cupertino, where Infinite Loop is located. The need for even more space has been cited as the main reason for the building of Apple's new "spaceship" headquarters. The Sunnyvale campus is also shared with other tenants. For example, one building serves as headquarters for development company CPP, while IT security startup Illumio has also taken up residence there. But another building at the complex, street number "175," has no listed tenant, despite being off the market for months. And building permits for tenant improvements at the site reveal that it includes a 4,239-square-foot "repair garage" —without acknowledging the current lessee, an unusual practice. When visited in person, the office at building "175" is advertised as home to a mysterious company named SixtyEight Research. Aside from a sparse website registered through GoDaddy less than a year ago that reveals virtually no information about the company, SixtyEight has no discernible online presence. For a self-proclaimed "innovative" company that's "redefining market research," SixtyEight's existence at the Sunnyvale office complex, where it's right under Apple's nose, has been strangely quiet. Is SixtyEight a real company, or is it a way for Apple to maintain secrecy on a project hiding in plain sight? According to one AppleInsider source familiar with "Titan," many of Apple's new auto-related hires, including recruits from Tesla, have been working out of the Sunnyvale campus. This person claims that some of the projects underway there have been kept "very secret" within the company. It is said that the "Titan" development building itself is codenamed "SG5." To keep their presence under the radar, Apple employees have allegedly been told to turn their official company badges around when entering the building. To keep their presence under the radar, Apple employees have allegedly been told to turn their official company badges around when entering the building, so they will not be seen by members of the public. For guests who are granted access to "SG5," it was said that badges are provided which look identical to those issued at 1 Infinite Loop, sans an Apple logo. Separately, another source, who does not have a proven track record on Apple rumors, said that the company has bought automotive testing hardware that was delivered to offices near its Cupertino headquarters. While this person didn't specifically name the Sunnyvale location, they did identify the location as a "relatively new" addition to Apple's corporate offices. The questions about Apple's operation don't stop there, as government-issued permits for construction at the campus only add to the intrigue. The City of Sunnyvale has issued a number of permits to Apple at the site, proving the company leases at least three of the campus's seven properties. Apple has taken residence in the building with the largest footprint, which is outfitted with a battery room, reliability lab, water ingress lab, 2,000 gallon tank, conference room, break room, computer labs, and test chambers. Outside are bicycle parking facilities, while two large loading areas flank a row of overhead doors installed to the rear of the building. Evidence suggests Apple is conducting research and development and quality assurance testing at the site. Apple has labs in California dedicated to stress-testing new products, one of which was opened to media last September after the iPhone 6 "bend-gate" controversy. 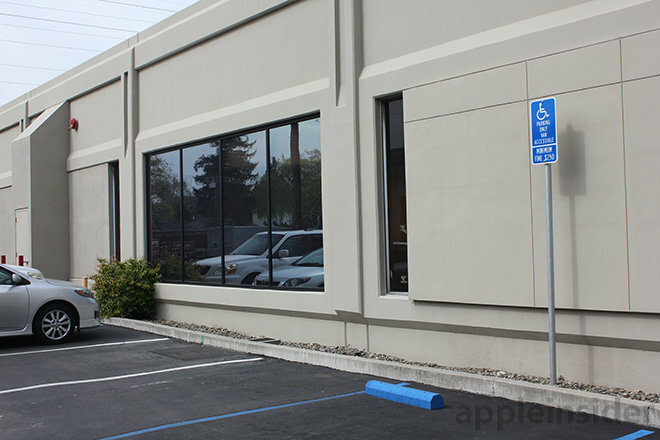 Although Apple is rumored to be working on advanced battery technology, the building's battery room is likely used as a power backup or uninterruptible power supply for computers, servers and other integral machinery. Apple pulled more permits for this building than any other company leasing space in the Sunnyvale complex did for their own. Recent inspections were conducted on emergency radio systems, fire sprinkler installations and general construction. Inspectors completed a check of wall upright sprinklers on Feb. 18, and another inspection for overhead installations is coming up this month. Late last year, an operations trailer and various vehicles from Devcon Construction were spotted outside the warehouse-like structure. Devcon is a major Silicon Valley contractor responsible for corporate campuses built by Yahoo, Adobe, Cisco, Marvell and more. The firm also performed remodeling jobs for A-list tech companies and has experience in sustainable building. Apple is listed on this recent permit as the tenant making improvements. 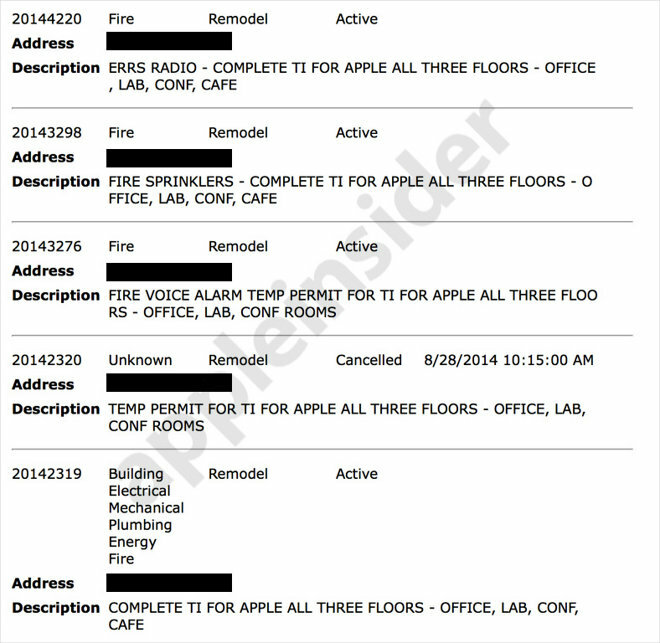 Apple is also listed as the tenant on all three levels of the campus's flagship building next door, permits show. Inside is space for a cafe, conference rooms, offices and multiple rooms labeled "lab." 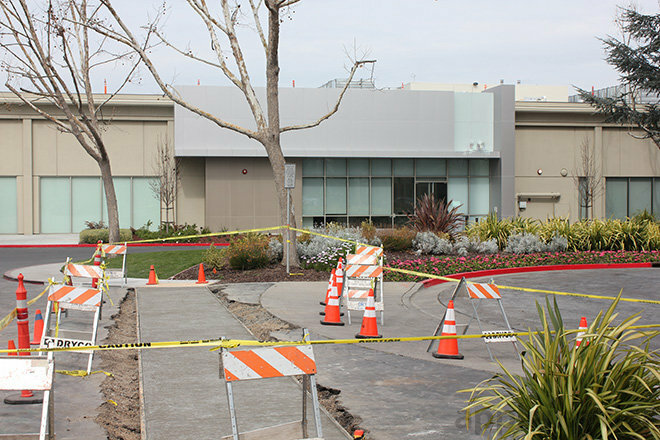 Apple recently asked select developers to test out WatchKit at its labs in Sunnyvale, and while the exact address was not disclosed, a three-story campus building would be an ideal place to host such a program. 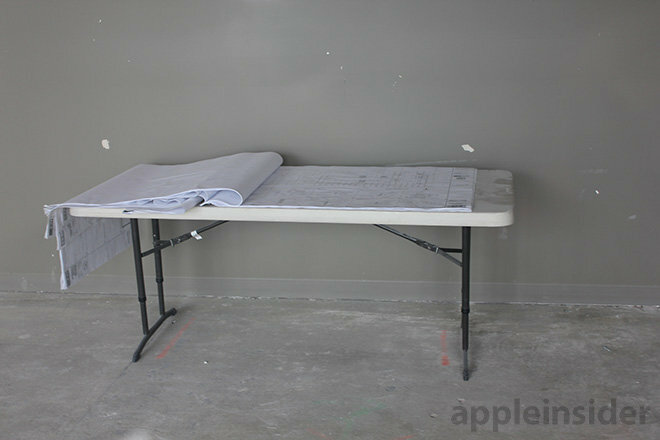 At another building on the campus, permits show Apple has outfitted the space as an open office. Little else is known about that building, which appears to have undergone fewer renovations than its neighbors. One AppleInsider source with knowledge of the company's structure said that much of the App Store review team works out of Sunnyvale, suggesting that group is likely the primary occupant of one or more of these buildings. The complex's remaining addresses —"165" and "175" —are shrouded in secrecy. Both buildings "165" and "175" recently underwent renovations to build out a repair garage and auto work area, but oddly have no tenant listed. At building "175," where SixtyEight Research is located, the story is especially interesting. Permits show recent fire sprinkler inspections for both the 4,239-square-foot windowless repair garage and 7,520 square-feet of office space. Out back is a rolling overhead door, large enough to easily fit a car or minivan. Most recently, the property assigned to SixtyEight underwent interior demolition work for an unspecified project earmarked for generic tenant improvements. Next door, no tenant is listed on the tenant improvement permits issued for building "165," the same unusual practice found for work at SixtyEight's facility. Recent filings point to the construction of an "auto work area," as well as office and meeting space. A raised landing located on the north-facing wall serves as a loading zone. A company identified only as "SixtyEight LLC" was registered last March in Delaware, then licensed as a foreign corporation in California last November. Notably, that firm later paid to import a 1957 Fiat Multipla 600 from the U.K. into the U.S.
Jony Ive, Apple's British-born head of design, is known to have a soft spot for the Fiat 500 that he drove while in school. He and co-designer Marc Newson also auctioned off a Product(RED) Fiat 600 back in 2013. 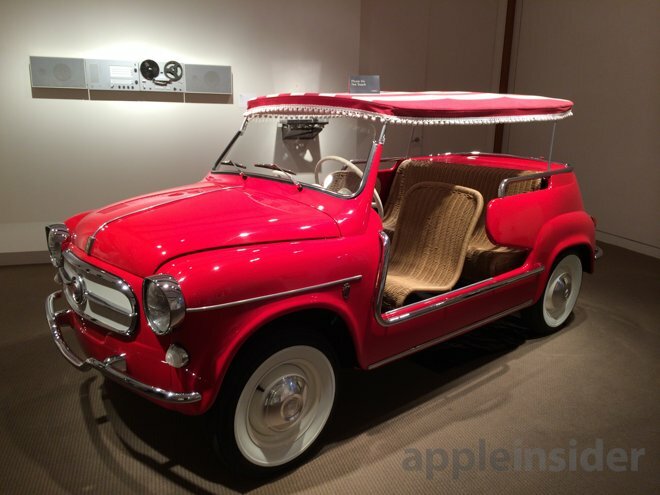 Apple's Jony Ive and Marc Newson customized this Fiat 600 for a charity auction in 2013. Ive has an affinity for Fiat's design. SixtyEight's affiliation with Apple could not be confirmed, but Apple does have a long history of using shell corporations and deceptive methods to hide its secret projects. Aside from a barren website, there is scant other information about SixtyEight— lending more credence to its use as a front. It wouldn't be a stretch to surmise that SixtyEight could play a role in allowing Apple to purchase and import automotive equipment and tools without drawing any suspicion. Apple, after all, is the biggest company in the world, and has been known to force engineers to use false names in the past when visiting suppliers to avoid unwelcome attention. 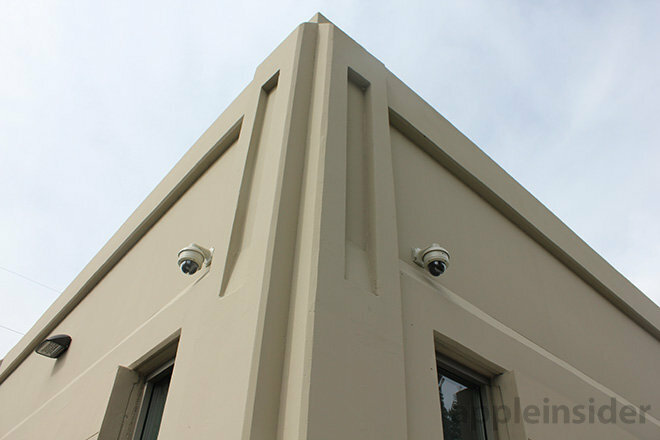 When AppleInsider visited SixtyEight's headquarters at building "175" earlier this week, its windows were a "frosted" opaque, and security cameras were visible outside. While this is not unheard of for an office building, it does seem somewhat odd for a little-known market research company. The security measures seen there are also similar to those spotted at other Apple facilities. Even more interesting, however, was a note taped to SixtyEight's front door. It informs drivers that the company's lobby has been moved to a new address: the same office complex's flagship three-story building, leased entirely by Apple.